This is an archived 2008 blog post describing the Zeer mobile webapp. Zeer shut down in late 2011. Zeer is a new web (zeer.com) and mobile (m.zeer.com) site dedicated to groceries. It’s full of information about branded food products. With Zeer you search for a product like “Corn Flakes” or “Green Beans” and get listings with ingredients, nutritional information and user reviews. Just about any branded edible or drinkable item seems to be indexed including alcoholic beverages. 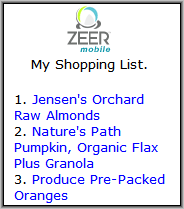 You can also create and manage grocery shopping lists using Zeer. When you add a item to your Zeer shopping list it becomes a link to Zeer’s information page for that product so you can quickly revisit the ingredients, nutritional information and reviews. Zeer also hosts user forums on a wide variety of food related topics ranging from specific food allergies to cooking and cancer prevention. Zeer on the mobile web contains the core of the service’s features. Shopping lists can be viewed, and you can search for products and read some, but not all of the product information on the full site. I had some problems with Zeer’s mobile site. There are some markup errors that prevent it from working on many mobile browsers. Openwave on a Motorola i855 gives up with a “compile error”, Opera Mini and even desktop Opera 9.5 complain, “Error: XML declaration not at beginning of document”. The Opera browsers let me bypass the error but the site is still unusable as the submit link in both the search and login forms is not clickable. The site does work in S60WebKit and Opera Mobile 8.65. I can’t stress this enough though, if you are building mobile web sites, make sure they validate. Mobile browsers can be very unforgiving! Update 19-Aug-2008: Zeer has fixed the errors, the site now loads without error and works properly on all my handsets including the i855 and with Opera Mini. 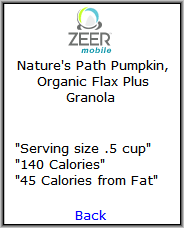 The biggest limitation of Zeer Mobile for me is that the nutritional information only includes Serving Size, Total Calories and Calories from Fat. Why not include it all, I want to know about Carbs, Sodium and Saturated Fat too. 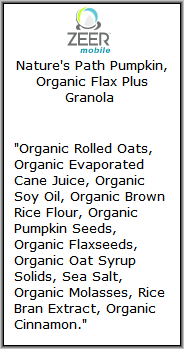 As the nutritional information is a separate screen in the mobile version there’s no reason not to include the complete list, it’s only a few lines of text, shorter than the ingredients list in most cases. I’d also like to be able to register for Zeer using the mobile site and the option of logging with an easy to type user ID or PIN rather than an email address. Typing @ signs on most phones is an unnecessary usability hurdle. Zeer doesn’t seem to include generic and bulk products like produce. A search for “oranges” lists a few brands of prepackaged fresh oranges but none of the listings include nutritional information. Who cares if their bulk oranges are labeled “SunKist” or “Reo” or not branded at all? It would be more useful to list produce by variety like “Navel Oranges” or “Valencia Oranges” and to show the nutritional information for these generic foodstuffs. I like Zeer, there’s a need for a site like this. Interest in healthy eating is at an all-time high. And no wonder, we are in the midst of a world wide epidemic in obesity and diet related illnesses. WHO reports that worldwide obesity rates are up throughout the developed world, running from 5% in Japan and China to 75% in urban Samoa. The US rate is an appalling 30.5%. Being overweight is the single biggest factor for developing diabetes and high blood pressure. Excess weight also increases the chances of developing many types of cancer, osteoarthritis and other diseases. Avoiding obesity and losing weight is something all of us should be concerned with, and that means getting enough exercise and limiting caloric intake. Besides obesity there are other reasons to watch what you eat, including food allergies, avoiding suspected carcinogens, and religious or personal dietary restrictions. Plus, we all want tasty food which is where Zeer’s user reviews come in. Registered Zeer users can write reviews which consist of a star rating and description. The average rating for each product is displayed in Zeer’s listings with a link to the reviews. This entry was posted in Shopping and tagged allergies, food, nutrition, shopping by Dennis Bournique. Bookmark the permalink.